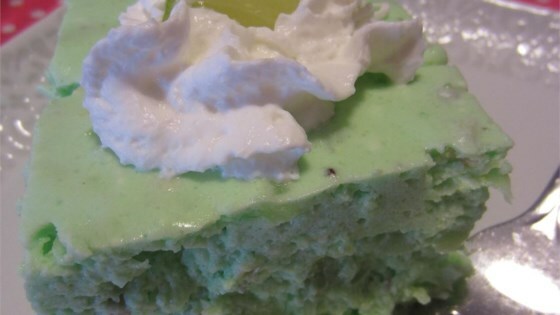 "This is a great recipe my mom got from my aunt. She has made it every year for Thanksgiving. It is a family tradition for us. It can be made a day or two ahead of time, if you like. It looks just beautiful in a cut crystal bowl. Thanksgiving is not the same without it for us! We just 'gobble' it up! Chopped walnuts can be substituted for chopped pecans." In a large bowl, pour 1 cup boiling water over the gelatin mix. Stir until dissolved, then stir in 1/2 cup pineapple juice. Refrigerate until thickened but not set, about 1 hour. Meanwhile, place crushed pineapple and remaining juice in a small saucepan. Bring to a boil, reduce heat, and simmer for about 5 minutes. Remove from heat, and cool to room temperature. In a large bowl, blend softened cream cheese and lime gelatin until smooth. Mix in the cooled pineapple. In a medium bowl, whip cream until soft peaks form. Fold into gelatin mixture. Fold in chopped nuts. Pour into a pretty crystal bowl, and refrigerate for at least 4 hours, or until set. I was not impressed with this salad. Sorry. I guess I was expecting something more. I added one package of instant vanilla pudding and that seemed to improve the flavor. This is a wonderful salad. I made it for the family Christmas buffet and added a layer of red jello to the top for a festive look. It will be a new family tradition. Maraschino cherries are a must... they add a beautiful color that's especially nice at Christmas. It was really good, just like the kind at Luby's.